You can customise the course or units in myUCA so they are more distinctive and relevant to the subject area. This in turn can improve the overall student experience of myUCA. 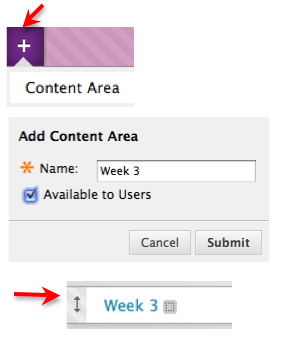 You can add a banner image at the top of each course or unit area. It’s best to create your banner in Photoshop or a similar programme so that you can specify the width and height. Aim to keep your banner about 700 pixels wide and no more than 150 pixels deep. When you’re ready to upload it, find the Control Panel in the lower left of your course or unit area, click Customisation > Style, then scroll down until you see the Browse My Computer button. Locate your image and click Submit to upload. You can also choose the landing page under Style, by default the landing page is announcements. When you are uploading learning materials to myUCA, make sure that they are clearly laid out to make it easy for students to browse and find them. You can create folders to organise content, for example you might want to use a folder for each week. However, try not to put folders within folders as this makes it harder for students to find your learning materials. You can also add extra areas into you unit menu if you need them. To do this, hover over the ‘+’ in the top left of the menu and choose Content Area. Enter a name, then tick the box marked Available to Users and click Submit. Your new content area will appear at the bottom of the menu, and you can click on the left of the content area and drag it to wherever you want to in the menu.